System on Module Market size estimated at around USD 1.5 billion in 2018 and is predicted to grow at a CAGR of 15% from 2019 to 2025. The system on module market is rapidly evolving as manufacturers are focusing on producing compact yet highly capable modules. The demand is driven by embedded systems owing to their ultra-low power consumption and computing performance. Embedded systems have gained popularity over the years owing to their wide range of applications in diversified industries. Important benefits of these components are flexibility and scalability they offer in designing the embedded systems. Due to this, they are being implemented in custom designs and application-ready devices needed in the medical and defense industries. Robotics and industrial automation have transformed manufacturing processes with the implementation of complex embedded systems, creating a market for more efficient and powerful SoMs. Manufacturers across European and Asian regions are adopting smart factory trends to increase efficiency and productivity. The implementation of these modules in devices for computing reduces the time to market, which is a crucial determinant of business success. Artificial intelligence has transformed medical and electronics industries with the integration of advanced features, creating opportunities for system on module market growth. High demand for computing capabilities has increased the complexity of embedded systems. X86 processors-based SoM uses multiple cycles with more instruction set computing, which will further contribute to the overall complexity of embedded systems. 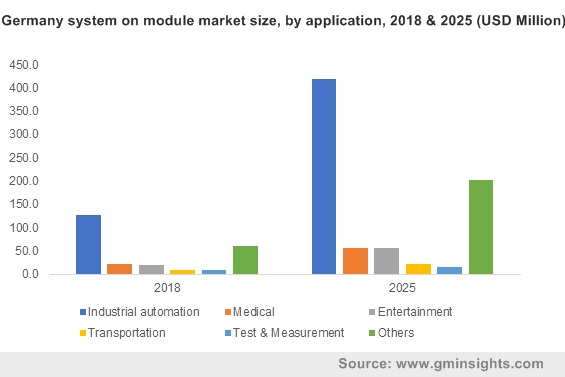 Moreover, they have experienced a rise in their prices over the years, which will negatively impact the adoption of system on module (SoM) market. ARM, x86, and power are the major processor architectures used for SOM modules. The ARM processor architecture holds the majority of the market share and is projected to exhibit a high growth rate. Manufacturers adopt ARM-based processors for their modules and boards owing to their lesser complexity compared to x86 processors. ARM Holdings Corporation is the designer of ARM architecture and provides the license to other manufacturers for building their own processors. Major manufacturers providing ARM-based SoM are Digi International, congatec, and Kontron. 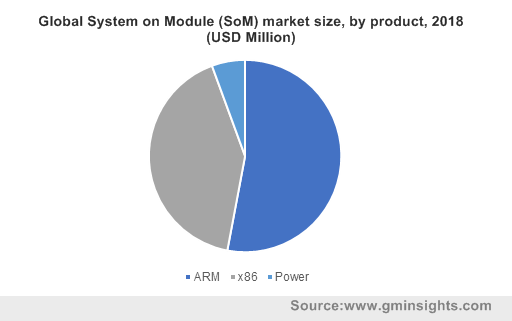 The popularity of ARM-based processors in the system on module market has rapidly increased owing to their single cycle computing with reduced instruction sets. AMD and NXP Semiconductors are the major suppliers of ARM architecture-based processors for the global market. Power architecture-based modules are less adopted as compared to x86 and ARM-based processors. IBM designs them and they use Reduced Instruction Set Computer (RISC) platform like ARM processors. IBM and NXP are some of the major manufacturers of Power architecture-based processors for SoM. An important feature of power-based SoM is that they can add scalability in the system without adding additional hardware, unlike x86 processors. Microsys is one of the manufacturers providing SoMs based on power architecture. The system on module market has seen rapid growth due to the demand for powerful & flexible embedded systems in industrial automation. Increasing demand for automated technologies in the industrial processes, such as manufacturing, assembly, logistics, and supply chain, support the integration of embedded computing solutions. The rise in the demand for smart and energy-efficient electronic products to be deployed in the automation applications is further increasing the consumption of embedded systems. Machine vision and artificial intelligence have made it easier to automate the processes with advanced SoM. The need for industry compatible embedded computing systems is driving system on module (SoM) market growth. Embedded computing modules are increasingly being integrated into entertainment systems. The demand for high graphics, performance, and seamless entertainment experience has resulted in system on module market growth in the entertainment industry. Increase in disposable income of people has made entertainment more popular and one of the prominent application areas. In addition, test and measurement technologies are shifting toward high frequencies with precise & accurate results. The use of the IIoT in test and measurement has created challenges for developers to design compatible embedded systems. 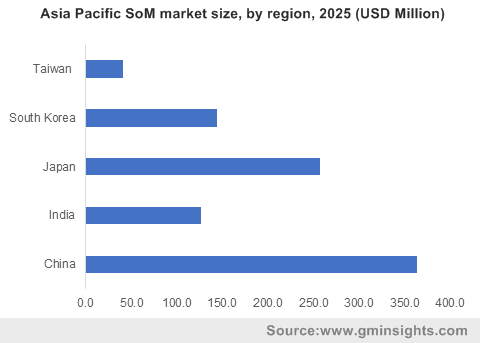 Asia Pacific is projected to exhibit a high growth rate in the system on module market due to increased manufacturing facilities by global OEMs in countries like China and India. The economic developments are driving the demand for advanced embedded systems and powerful computing devices. Europe contributes with a major revenue share in the industry. Germany, France, and the UK are countries with the presence of a large number of automotive & other manufacturing companies, boosting the adoption of advanced embedded systems in industrial automation. European countries have a strong infrastructure and capabilities for adopting new computing technologies. 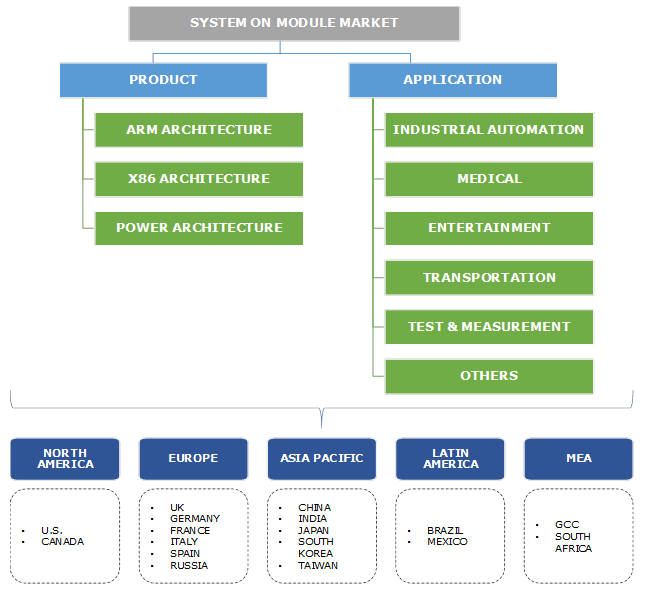 The system on module market is highly fragmented with the presence of several manufacturers and component suppliers across the globe. Digi International, congatec, SECO, Kontron, Adlink, and Advantech are some of the major manufacturers in the industry. The competitive landscape is highly competitive owing to the presence of a large number of established players and new entrants. The prices of SoM have declined over the years as a result of technological developments in the semiconductor industry, leading to competitive pricing strategies. Intel, AMD, NXP, and Xilinx are the key component suppliers for the system on module market. Intel holds a major share for x86 processors market globally while AMD and NXP are the prominent names for ARM processors. The rapid developments in technologies and upgradable processor architecture will create challenges for component suppliers to keep pace with competition and technological advancements. Embedded systems were simpler and straightforward in design during earlier times but the need for highly complex and powerful computing devices has changed this scenario. Industry 4.0 and the IoT have forced embedded computing devices to be highly compact yet powerful, leading to continuous developments in the system on module (SoM) market. Embedded system manufacturers prefer SoM over single board computers due to their ultra-low power consumption and scalable architectures. Robotics and machine vision technologies have influenced manufacturing facilities to be adopted with the latest computing & smart embedded systems.